Cichlid fish are one of the most biologically diverse groups of vertebrates on the planet. This diversity (as well as population size, reproduction rate, etc) allows scientists to study the cichlid evolution, and the role of natural selection, more closely than other populations. Many aspects of cichlid characteristics have undergone (and are currently undergoing) selective pressures. Cichlid evolution can be found at multiple levels, including behavioral changes, molecular adaptations, size and coloration variation. Thorichthys meeki is a species of cichlid commonly known as the “firemouth”, because of its bright red-orange coloration on the jaw. This specific coloration is unique to the firemouth, and is used in mating, competition and defense, and is therefore strongly affected by selective pressures. 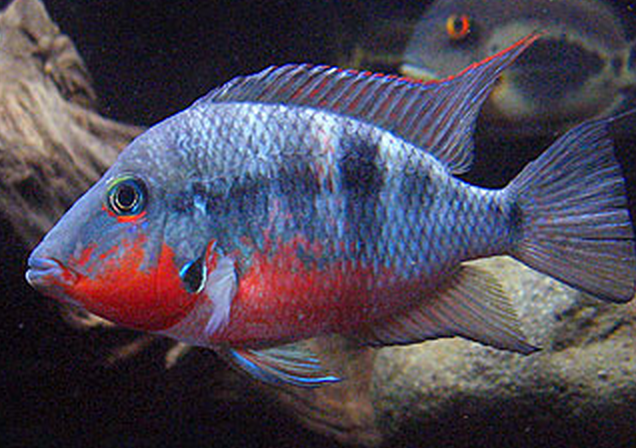 In general, male firemouth cichlids have prominent jawline coloration (10). The female Firemouth cichlids have specific molecular adaptations that that allow them to see the male coloration very clearly (6). In the case of the firemouth cichlids, jawline coloration in males (and the subsequent female response) plays an important role in the evolution of the species due to the pressures of sexual selection. Sexual selection has been shown to be a mechanism of significant biological change for firemouth cichlids, even if the environment stays very stable (9), and research confirms that male coloration corresponds to sexual selection by the females (8). The females tend to mate with the more dominant males, so any characteristic that improves one’s chance of winning in a male-male competition scenario will be selected for. In any cichlid population, males who display the same color will compete more intensely. In firemouth cichlid populations, all of the males have a distinguishing red color, so male-male competition is very strong (4).